When we were getting ready for our move overseas I started taking an inventory of our pantry with hopes of using up the food we had as much as possible before we moved so it wouldn’t go to waste. I keep a separate pantry shelf just for the blog supplies so it was a treasure mine of sweet goodies. 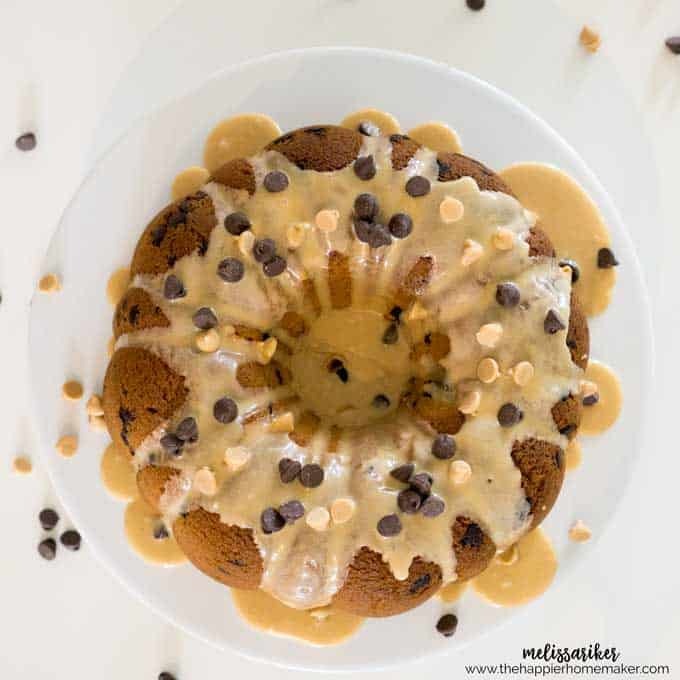 When I pulled everything out and laid it across my counters I started thinking about how I could use various items together to make new recipes and this Chocolate Chip Peanut Butter Cake came to mind, and oh my, am I glad it did! 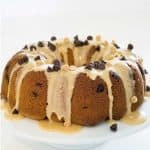 Light and fluffy, with a delicate peanut butter flavor and swirling with chocolate chips, this cake is made even better by a rock-your-socks-off peanut butter glaze and the chocolate and peanut butter chips added on top! My 9 year old told me it was one of his favorite recipes yet-and he’s my top taste tester so that says a lot! Preheat oven to 350 degrees. Brush a bundt pan generously with vegetable oil. In a stand mixer combine cake mix, water, 1/2 cup peanut butter and eggs on medium speed until uniform. Stir in 1 cup chocolate chips. Pour batter into pprepared pan and bake for 50-55 minutes or until toothpick inserted in middle comes out clean. Cool 15 minutes in pan. Loosen cake from side of pan if necessary and invert onto cooling rack. Cool an additional 30 minutes. To make the glaze combine 3 tablespoons peanut butter with milk until smooth. Add powdered sugar and mix. If glaze is too thick add an additional tablespoon of milk. 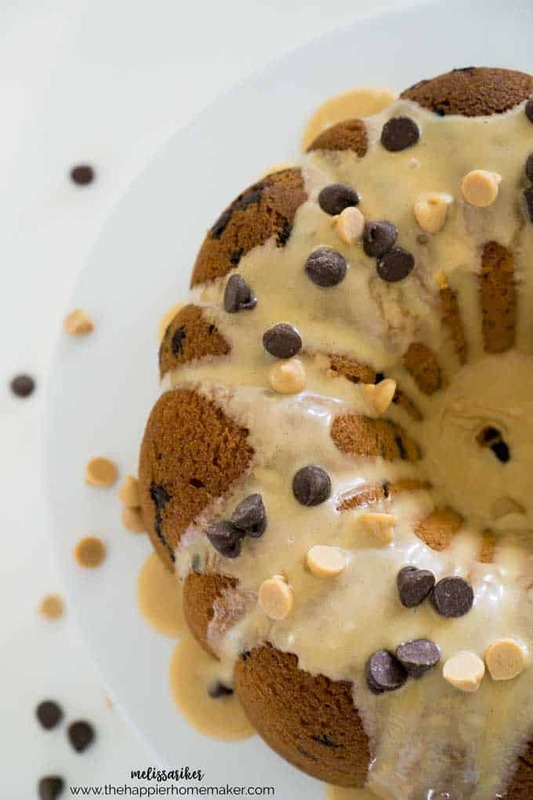 Drizzle glaze over cake and sprinkle with remaining chocolate and peanut butter chips. Delicious peanut butter cake with chocolate chips inside topped with peanut butter glaze and chocolate and peanut butter chips! A perfectly indulgent dessert recipe! Brush a bundt pan generously with vegetable oil. In a stand mixer combine cake mix, water, 1/2 cup peanut butter and eggs on medium speed until uniform. Pour batter into prepared pan and bake for 50-55 minutes or until toothpick inserted in middle comes out clean. Cool 15 minutes in pan. Loosen cake from side of pan if necessary and invert onto cooling rack. Cool an additional 30 minutes. To make the glaze combine 3 tablespoons peanut butter with milk until smooth. Add powdered sugar and mix. If glaze is too thick add up to an additional tablespoon of milk. 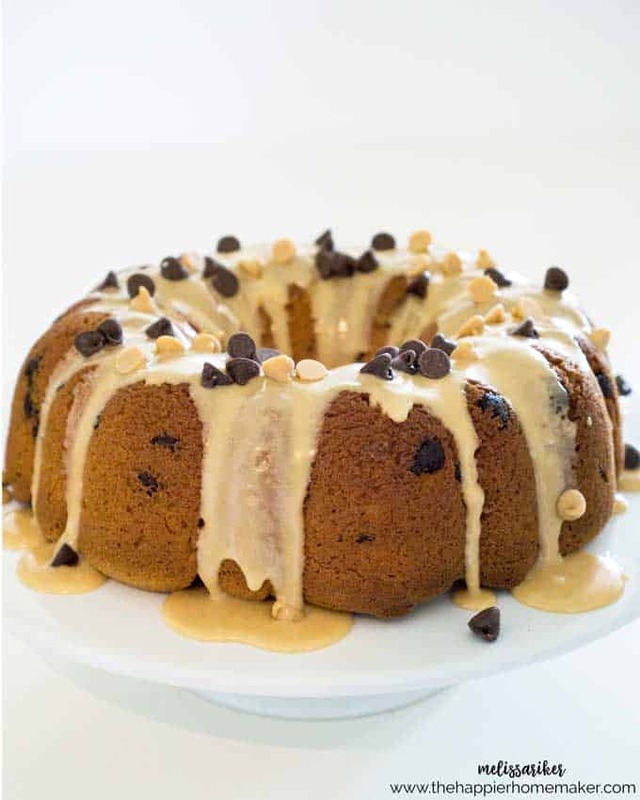 Drizzle glaze over cake and sprinkle with remaining chocolate and peanut butter chips. I’d love your feedback on the recipe-please leave me a comment below! Love your blog. Good luck with the big move!